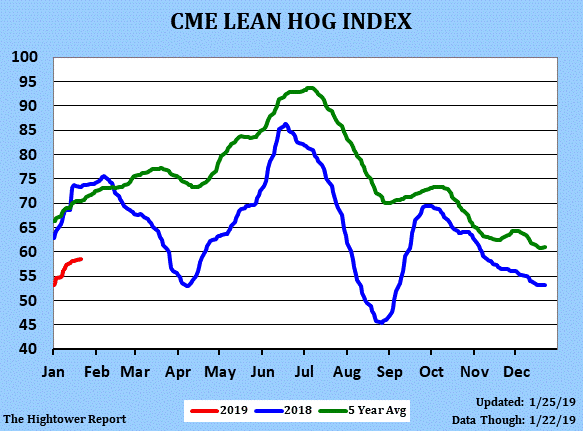 Last week the lean hog futures markets started on a tear to the upside closing limit up in April, only to fizzle out by Tuesday afternoon and cruise lower into the weekend. We shorted the board about 1.80 too early on Monday. Were happy with how the week ended but certainly could have timed things better. This is how it goes sometimes. The long talked about Chinese US pork demand has yet to materialize, and the CME has spent the last month extracting premiums. I know there are a lot of guys out there who are screaming to get long. If you followed them in at higher prices I don’t think it is smart to bail – we think a bounce is at hand. 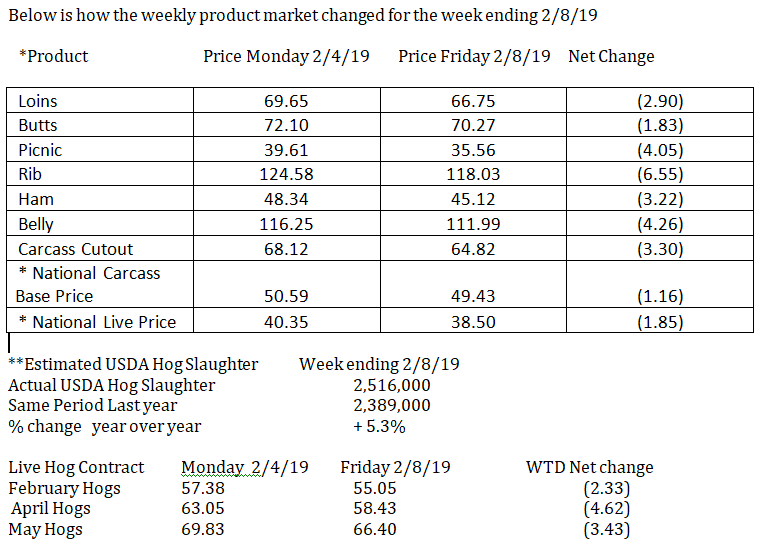 April and June 2019 Hog futures are now back to normal values relative to cash, but the current problem in the hog market is that pork demand has not kept pace with the increase in production. Both the pork cutout and cash hog values are below a year ago, while front month February goes off the board near a contract low. Meat traders are praying that China will become a larger pork importer of US or other world pork sometime in 2019. It feels like the market lost some hope when the Trump announced the late Feb meeting with China’s Xi wouldn’t take place. Futures are oversold, to get any turnaround to hold, slaughter needs to fall a couple hundred thousand as we get into the spring. Our call on the loins and butts last week was steady to firm and bottoming. We are still on track with that belief. There is a caveat, as slaughter needs to slow down. The front of the curve may have a tough time rallying as long as slaughter remains at this level. If you recall, weekly slaughter was in the 2.3 million as front month contracts were going off near even to the next contract. This week Feb goes off, it currently sits at a 4.00 discount. As long as the weekly kills levels stay at or above 2.5 million head, all of the cuts on the USDA will have a tough time going higher. The ham market has not only had to deal with the large weekly kills but the tariffs imposed because of the trade imbalance with Mexico and Canada. While the new agreement has had much publicity, it will definitely help US meat exports, hams included. But the NAFTA replacement is not through congress yet and will have a tough time passing in this political environment. Exports should be constrained until it does. The belly has performed decently, but hurdles remain. The question is can the bellies stay above a $110? Only if slaughters would slow. If we are seeing kills above 2.5 million over the next few weeks, sustained rallies driven by bellies in April futures will be difficult to come by. The industry will need exports to offset the extra production otherwise product prices will continue to deteriorate into the spring. As a result packer margins will narrow. There are China talks scheduled in Beijing this week. We took a long June position with anticipation the board puts in some premium sometime soon. The weekly live weights should stay in a 2 to 3 lbs. range for the next several weeks, if the producers keep marketing their hogs in a timely manner. We are looking for hard breaks in order to buy summer hogs and are gambling the slaughter will slow as profit margins narrow. Our advice is to be patient and look to buy summer hogs on breaks. We believe that under $74 June 2019 hogs are a value. The market has a steady carry between June and August. The downside could be somewhat limited in June, selling should occur in April if given the reason. We plan on selling J on rallies. We still like buying April hogs on breaks and trading them from the long side for a 100 to 200 point rally. Or you can do it the other way sell April hogs on a 1-200 point rally. Both of these recommendations are just trades to try and a capture a few dollars. We caution our readers that neither one of these trades buying or selling April hogs is meant to be a long term trade if the rec comes out. Pay attention to the 10 day forecasts especially the potential for cold fronts or snow storms predicted. We have a couple of storms approaching the eastern and western corn belts as of this writing. If you are not already a subscriber to The Swine Times, click here to have The Swine Times delivered to your inbox! This article originally appeared in the The Swine Times Newsletter “The Swine Times 2/11-2/15” on 02/11/19.